Jesus? Forget the fairy story. Many currents fed the Jesus myth, like streams and tributaries joining to form a major river. As Christianity cut its way through the centuries it became a very murky and dangerous torrent, sweeping away civilizations and all who stood in its way. Piety and Dreams Sire a Godman • Growing the dream • Composite Hero • The God Who Never Was • Glory – The Greatest Man Who Never Lived. 2. What DID the Early Christians Believe? Bizarre Beginnings – The Assortment of Early Christian Belief • Nice Gnostics – Christian 'Mystics of Knowledge' • Making an Apology • Orthodoxy and the Early Church. Conjuring up Catholicism – Religious Fusion in Egypt • Silk and Spice – The Buddhist Influence in Christian Origins • Dress Rehearsal for Christianity – Mithraism • The Church of the Shadows – Waiting in the Wings. 4. Just Who Were the Jews? Genesis – First invent your Jew, then invent your Christ • Out of Egypt? Palpable Nonsense • Imperial Israel? King David, The Boy Wonder • King Solomon? The Emperor with No Clothes • On the Margins of a Real Empire – Israelites and Assyrians • Babylon – Nurturing the Jewish Priesthood. The Ever-Changing Word of God • "Mark" • "Brother James" • The Mythical "Virgin Mary" • The Mythical "St Peter" • "John" • "Luke" • "Matthew". A Surfeit of Jesuses! – But No "Jesus of Nazareth" • Nazareth – The Town that Theology Built • The "12 Apostles" • Would they lie? – Copy and Glorify! • Non-Christian Testimony? • Jesus Christ – Paragon of Virtue? World Culture Confounds the Jews • Militant Tendencies • The Apostle Paul • 'Wars & Rumours of Wars' • The Piety and Vengeance of Hadrian • Rabbinic Judaism Inc.
Constantine – Pagan Thug Makes Christian Emperor • Into the Darkness • Christianity's "civil war" – The Struggle for Power • Pope Damasus – The gangster who hired a pimp to rewrite the Bible! • Theodosius – Murdering the Competition • The Closing Mind – Death of Tolerance • Christianizing of the Heathen • Sin. Love Your Neighbour? 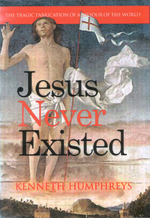 • Demolishing the Jesus Myth – a history.